Grasping a T-shaped metal tool, Megan Van De Giesen leaned in and pierced the dry, hard soil with its sharp point. Then she took a small American flag, knelt down, and planted it firmly in a grassy stretch of Boston Common. Stepping a few inches to the right, she repeated the task, pushing down, piercing the ground, and planting another flag, and then another, and another. For the last several years, this has been her ritual, a way to honor her husband, a Marine pilot killed in Afghanistan. Together with veterans and other family members who have lost loved ones to war, Van De Giesen helped fill in a vast expanse of the Common with 37,000 flags, one for each service member from Massachusetts killed since the Revolutionary War. Over the past seven years, building the Memorial Day tribute has become a source of solace for many veterans and family members who have found purpose in the simple, repetitive work needed to turn a grassy slope into a fluttering commemoration of valor and loss. “It’s just something that is as beautiful as it is sad,” said Van De Giesen, 35, whose husband, Captain Kyle R. Van De Giesen, was killed in a 2009 helicopter crash. 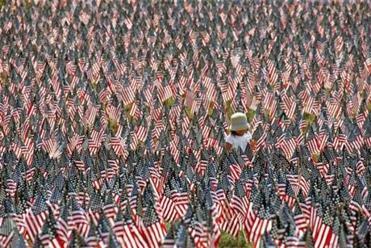 The ceremony was conducted as the last of 37,000 American flags were planted in the Common. For the volunteers, the work day began at 8:30 a.m. Wednesday, when Sean Naughton, a 45-year-old former Marine, showed up with twine and wooden stakes and began laying out a neat grid for the memorial, below the Soldiers and Sailors Monument. Naughton, who has helped set up the tribute for the last three years, said he wept before he started, and then stayed until 5 p.m., planting row after row of flags until his back was sore. As he worked, he handed out water bottles to other volunteers and pulled in veterans for hugs. “A lot of us have lost a loved one, so there’s a lot of brotherhood and sisterhood,” he said. When the Massachusetts Military Heroes Fund started the “flag garden” seven years ago, about 60 volunteers showed up, said Christie Coombs, a board member of the organization, whose husband, Jeffrey, was killed on American Airlines Flight 11 in the Sept. 11 attacks. This year, more than 500 volunteers turned out — a corps that included burly veterans, children, and downtown office workers in T-shirts emblazoned with their companies’ name. “It’s a family, it really is,” Naughton said. Jeff DaSilva, a 29-year-old former Army machine gunner who served in Afghanistan, said he has volunteered to build the memorial for the last four years since he heard about it from a friend. Gerry Maguire, 61, who served in the Army for 11 years, said he was helping out this year to honor the eight crew members killed when the helicopter he was riding in crashed in 1979, on a training mission between Fort Sill, Okla. and the White Sands Missile Range in New Mexico. For years after the crash, he said, he could not even say the word “helicopter.” Then a psychologist encouraged him to write letters to the crew members and read them to her out loud, and “that was very therapeutic,” he said. On Monday, Van De Giesen said she will take her children – Avery, 8, and Colin, 6, who was born four days after Kyle’s funeral — to affix a small card with Kyle’s name to one of the flags. Then, she said, she and her children will ride an elevator to the 52nd floor observatory in the Prudential Center and look down on the sea of flags that she helped to plant — a waving tribute to Kyle and thousands of others killed in combat.